Navigating the Complexity of Section 199A. Section 199A is arguably the most impactful provision of the 2017 Tax Cuts and Jobs Act. Business owner’s large and small, partnerships, real estate professionals, sole proprietors, investors and others may take advantage of the qualified business income (QBI) deduction. Congress awarded C-Corporations a significant reduction in the corporate tax rate. Congress’ solution to level the tax playing field for individuals and trusts is the passage of section 199A. Taxpayers may benefit from this deduction; however, numerous exceptions could limit the taxpayer’s ability to qualify for the deduction. Additional information, analysis, and review is now required to accurately report income and deductions under the new law. The preparers of flow through entity returns must report additional information to partners. Each partner must separately calculate QBI to determine if they qualify for the deduction. The Section 199A Treasury regulations estimate the total annual reporting burden for taxpayers to comply with 199A to be 25 million hours. Treasury further estimates each taxpayer would need another 30 minutes to 20 hours with an average of 2.5 hours to complete their tax return. Our goal is to provide a general overview of the Section 199A deduction and discuss some high-level strategies you may find helpful to maximize your deduction. Certain types of income will qualify for the QBI deduction. QBI includes income, gain, deduction, and loss from each qualified trade or business. A qualified trade or business must be effectively connected to the United States, its income must be included in determining taxable income for the year, and the trade or business must fall under the definition of a trade or business as set forth in IRC section 162. Qualified REIT dividends and PTP income are also qualified income. Per section 199A, a trade or business does not include a specified service trade or business (SSTB); or a trade or business performing services as an employee. An SSTB includes any trade or business where the principal asset is the reputation or skill of one or more employees or owners. These trades or businesses generally include businesses in the field of health, law, accounting, actuarial science, performing arts, consulting, athletics, financial services and brokerage services. As we will discuss later, individuals above a certain income limit may not be able to take the deduction if their income comes from an SSTB. unless the individual is below certain income limits, the individual involved in the SSTB will not be able to take a QBI deduction. Investment type income, reasonable compensation, and guaranteed payments to a partner are also excluded income from the QBI deduction. 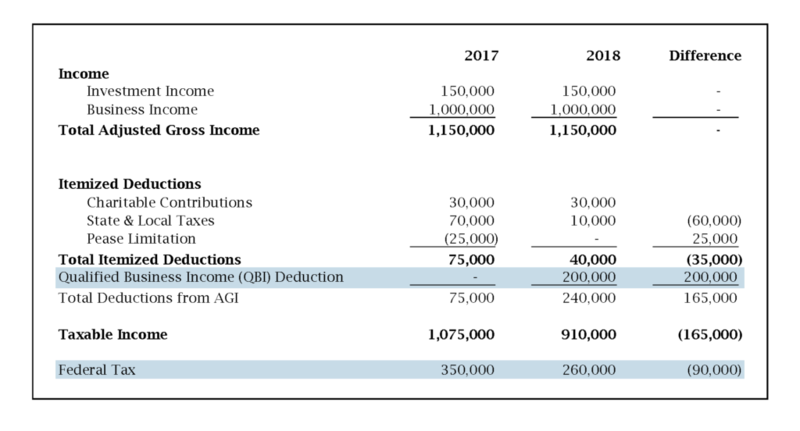 As you can see, the federal income tax savings due to the QBI deduction in 2018 can be significant. Section 199A has several complex limitations. The IRS has recently issued final treasury regulations addressing some questions regarding how to apply the limitations, but questions remain. Limitations apply based on income levels as well as the type of trade or business the taxpayer performs. Additionally, although the taxpayer calculates the deduction on their personal income tax return, certain information from the trade or business is needed to calculate the individual’s limitation. Single filers with taxable income under $157,500 and Married Filing Joint (MFJ) filers with taxable income under $315,000 are not subject to the QBI deduction limitations. Single filers with taxable income between $157,500 and $2017,500; and MFJ filers with taxable income between 315,000 and $415,000 are subject to phaseouts of the deduction. Is the business considered as specified service business? If yes, then you are not entitled to a deduction. The sum of 25% of W-2 wages with respect to the qualified trade or business, plus 2.5% of the unadjusted basis immediately after acquisition of all qualified property. This part of the code section makes calculating the actual benefit of the pass-through deduction for high-income taxpayers complicated. Additionally, this section contains ambiguity and unclear provisions that will need to be clarified by the Treasury department. Nonetheless, those clients below the income limitations can ignore these additional limitations and those clients above the income limitations should consider the various planning strategies discussed below. Stay below the income threshold – Many clients that have both pass-through or self-employment income and wage income from the spouse may consider filing Married Filing Separately if the spouses’ wage income is pushing you over the income limitation. Re-Visit Entity Selection – Many entities who were large operating S-Corporations may consider electing to be a C-Corporation. Additionally, there are certain circumstances that make re-visiting the selection between an S-Corporation and partnership relevant again. Bifurcate Blended Businesses – This strategy separates a business’s ineligible specified service income from eligible qualified business income. There are complicated rules and provisions that limit the ability to take advantage of this strategy, but it should be considered if you operate a business with both specified service income and non-service income. Aggregate Real Estate Business – Taxpayers who invest heavily in real estate may consider electing to aggregate their businesses. In some cases, this can help maximize the QBI deduction for high-income taxpayers. We would be pleased to discuss these strategies and other approaches to the Section 199A deduction with you in further detail. We analyzed these changes in planning for year-end with our current clients. We will also incorporate updated tax projections based on the 2018 tax filing season and updated guidance expected from the service on how the many changes to the tax code impact your income taxes going forward.